Tonight’s wine comes to us from Ozan Vineyards & Cellars, located in Shelby County, Alabama. A state typically known for their sweet Muscadine wines, the French Hybrid and Norton grapes have begun to take root. With ten operating wineries across the state, Alabama is a relative newcomer to the wine world. Recently passed legislation and a new wine trail have helped position Alabama as an up and coming wine destination for tourists and residents alike. Estate grown and aged in American oak, the 2007 Norton clocked in at 13.2% alcohol. A small production wine, only 100 cases were produced and is available for purchase online from their website for $17.99 (shipping available only to Alabama, Georgia, and Florida residents). I also received a winery logo glass with my purchase (a nice touch). I paired the Norton alongside a pulled pork sandwich topped with blue cheese and a Texas barbeque sauce. Exhibiting a dark, rich color, the Norton had an intense aroma of plums and dark cherries. In the mouth, a dry wine with dominant cherry, nutmeg, and spice throughout. A very solid effort that left me excited to experience more Norton wines. 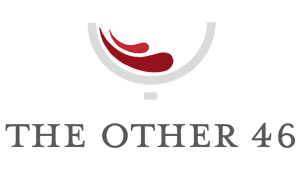 Be sure to visit Ozan Winery and tell them The Other 46 sent you. Cheers! 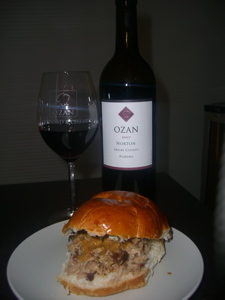 I can’t wait to try out the OZAN Cabernet Sauvignon and/or Merlot with a great Italian Dinner!